With a consistent schedule of high-profile events, including the annual Rodeo and Super Bowl LI in Houston, Texas; Harris County Sheriff’s Office, (HCSO), in coordination with Harris County Emergency Management and Harris County Central Technology Services recognized the need to dramatically update their communications infrastructure. To provide connectivity for event communications and to better coordinate during any potential threats to the area, Harris County required a unique solution: a highly efficient, rapidly deployable public safety broadband network; one that could operate wirelessly, seamlessly, and securely within the large urban environment of the city. The HCSO recognized the requirement to exchange real-time data, video, and communications feeds between federal, state, and local agencies including Homeland Security, Police, and city officials for crucial decision-making during major events, or during a disaster or attack. A more effective public safety broadband network could increase interoperability between different agencies and establish a secure, robust, private connection for critical communications while remaining less expensive than other options. Harris County’s emergency communications requirements presented several challenges. Various county and city agencies required the ability to rapidly deploy their mobile command center to any site across the area and initiate communications in under 10 minutes with non-technical personnel. In addition, the wireless platform needed to tie into their core private network, as well as handle the extended capacity needed to transmit HD live video feeds for event surveillance, operate data intensive application, and provide strategic communications between headquarters and officials in the field. 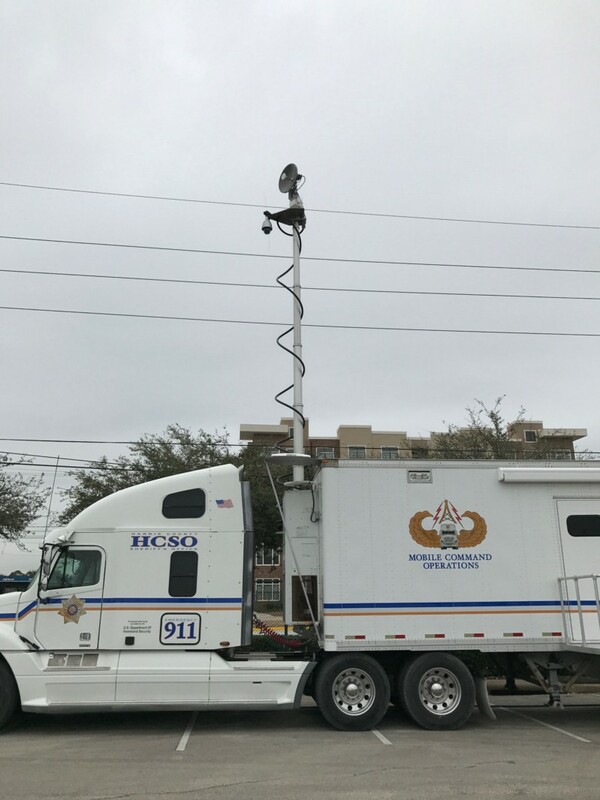 BATS provided an adaptive microwave network utilizing multiple BATS BTS-50 and DVM-50X antenna systems, which were configured to deliver data and communications to operators in the Harris County Sheriff’s Office Mobile Command Unit. Various HCSO Mobile Command Posts were outfitted with radio system equipment, on-board generators and cameras used for on-site support of Joint Operations Command during significant events. 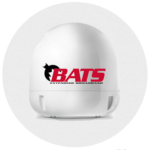 BATS utilized the BTS-50 platform to design nomadic wireless backhaul links that meet the bandwidth requirements needed for real time command, control, and surveillance including voice and data communications for Mobile Command Post deployments. The links were achieved by integrating a dedicated point-to-point (PTP) radio, such as the 4.9 GHz Cambium PTP 650 radio, with the BTS-50 on the mobile trailer. 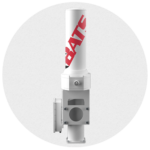 The tower side featured the DVM-50X paired with the 4.9 GHz Cambium PTP 650 radio, to transport high-speed; low-latency voice and data communications from the central network to the field. As a result of the planning and engineering of the team at BATS, its partners, and the HCSO Mobile Command Unit, this network is able to deliver an optimized broadband connection in less than a minute with minimal latency and data rates of up to 200 Mbps. Throughput of 180 Mbps+ to both of the HCSO Mobile Command Posts was achieved during the Superbowl LI deployment. Combined, this configuration provides operators in Harris County with 360° PTP coverage, allowing for a fully functional Public Safety Broadband Network (PBSN) with redundant operations centers in the event of a large event, wide-scale attack, or natural disaster. These locations serve to transmit data, communications and live video feed to police, military and public safety officials; providing the crucial data needed for essential asset deployment and decision-making.